Half-Past Kissin' Time: My Own "Ski Story"
I recently met a blogger IRL. I adore her; she is now my fifth, (much-younger) sister. three and a half hours of your vacation at a Subway "Restaurant." (especially when you are cheering the Pack on). And a bathroom with paper toweling! I like Subway to go, not to spend 3 1/2 hours there. Wow! I bet you set the record for the longest visit by a customer. I wonder what the Subway employees were thinking ...like geezz will these ladies ever leave!! lol! 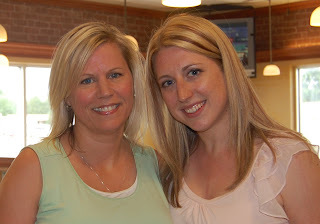 Great photo...and how fun to meet a fellow blogger and a Pack fan to boot! Nice picture anyway! I think you could spend a lot of IRL time around GB meeting followers in restaurants! It's nice that you met and had such fun together! Lucky gals! I love Subway, as long at it's a clean one. And the photo, it's good. The blur or whatever, gives it a soft effect. You look the same age, both teenagers! I hope they were baking bread the entire time you were there! Just a little extra touch for a lovely visit. tip a subway employee ?? What are people over generous in upper Wisconsin? So if you return the visit will you two be spending hours at Waffle House? I'm so jealous! I spent 3 hours in McAlister's yesterday, but it was with a friend I already knew. Let me know if you're ever "Tennessee bound"! That was a great three and a half hours!! I was blown away when I looked at the clock in the car and realized how long we had been talking! Time surely flies when you're having fun! The pleasure was all mine and I was so elated that I got to meet my most favorite Wisconsin blogger! Doh! I just wrote you an epic comment back and my dumb smartphone (or would that be smart dumbphone?) swallowed the whole stinkin' thing! AND one more thing - sorry beautiful lady; you can't convince me! Younger guys are just better at hiding the "looking" these days. You are a serious hottie!